Hebrews 4:12-13(KJV); For the word of God is quick, and powerful, and sharper than any two-edged sword, piercing even to the dividing asunder of soul and spirit, and of the joints and marrow, and is a discerner of the thoughts and intents of the heart. Neither is there any creature that is not manifest in his sight: but all things are naked and opened unto the eyes of him with whom we have to do. A man or woman of the Word can never fail to know the will of God for his or her life. 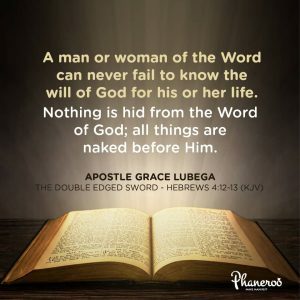 Nothing is hidden from the Word of God; all things are naked before Him. If nothing is hidden from the Word, then understand that the Word is the eye through which we see the future. By the Word, you can know your next job. By the Word, you can know who your spouse to be is. By the Word, you can tell whether the business deal you are contemplating shall be a success or not. Every time you find yourself contemplating a decision or the next step in your life, look through the eyes of the Word, you will know. You don’t need to hop from church to church to understand God’s call upon your life, look to the Word; that call is naked before Him. You don’t need to depend on men and women of God every time you want to take a step in life, look to the Word, that next step is naked before Him. A man or woman of the Word can never fail to know the will of God for his or her life. Nothing is hid from the Word of God; all things are naked before Him. PRAYER: Loving father, I thank you for this great truth. I was begotten by the Word, it is my nature, my heartbeat, my light and the center of my world. By it I move forward, by it I hear and by it, I stand. I am wise in everything that I do because I do so by the Word. I can never stumble because the Word guides my steps. To the glory of your name. Amen.